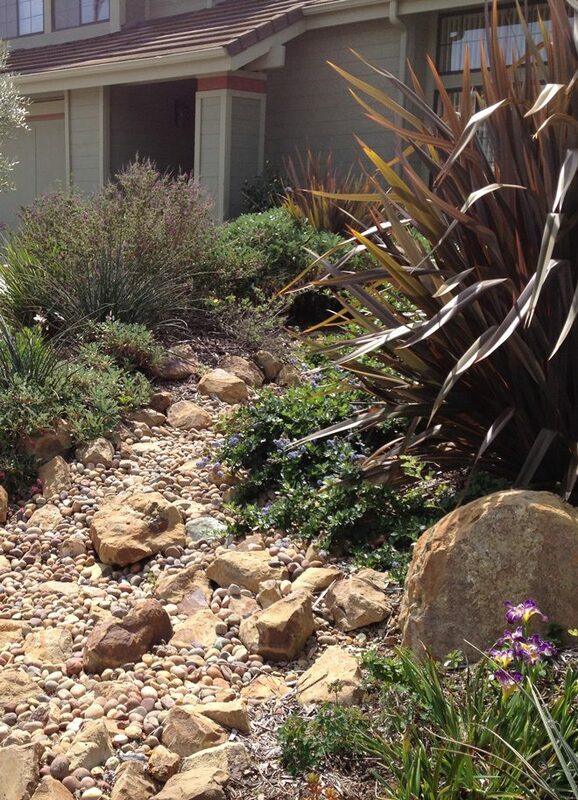 This piece concludes our four-part water-sensitive landscape design (WSLD) series. 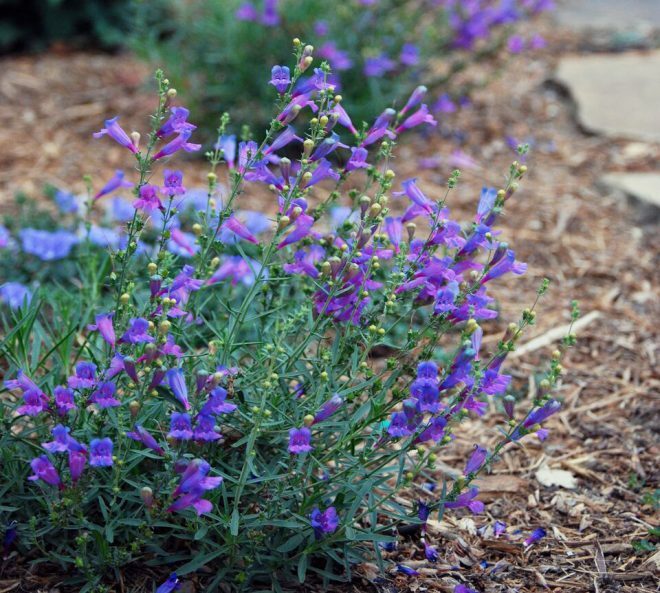 Managing the landscape during an extended drought means more than making smart plant choices. We’ve looked at shifting climate patterns, nurturing soil biology, and adjusting our approach to designing gardens. But it all comes down to water. This drought is hanging on and on. Finding ways to keep our gardens alive takes more thought and action then it used to. I did the easy stuff years ago: no turf grass, no high-water-use plants (except a few really great ones), and no spray irrigation. I resolved compaction issues so my soil can absorb more rain and I keep a good layer of mulch in the garden to feed the soil biology. And I use more native, low-water-use plants. I grow plants because they help sequester carbon, help keep my place in the world cooler, and support butterflies and all kinds of other creatures. While I may not be able to fix the world’s lack of action, I believe I can make a difference on my little patch of earth. And, because I’m a designer, this effort extends to my clients as well. Managing water is a critical component of creating gardens that thrive and are adapted to their site. Where appropriate, keeping water on site reduces pollution and helps mediate stormwater and its impact on our municipal infrastructure. If you’re sitting on top of an aquifer with open storage capacity, maximize infiltration to recharge groundwater and limit your water storage capacity. If you are on a hillside or a liquefaction zone, minimize infiltration and maximize rainwater harvesting for later, managed release. Your local water utility or government agency should be able to help you determine these factors. If you simply want additional water to keep your plants alive during these hot times, determine the right mix of allowing rain to gather in the soil and capture what your budget allows for irrigation later. An easy introduction to rainwater harvesting is a rain barrel. 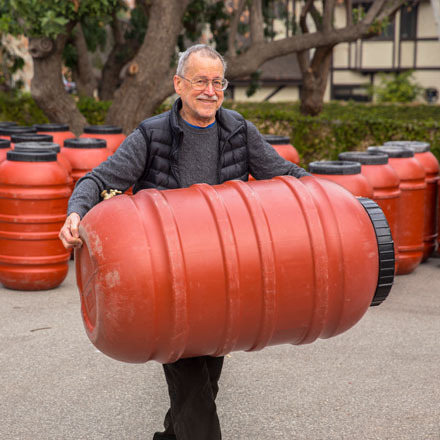 I wish I had a dollar for every time someone said to me, “what’s the point of a rain barrel if it doesn’t rain.” I’d have more money for larger water storage tanks. But how much rain can you capture and manage when it does rain? Every inch of rain that falls on a 1,000-square-foot roof equals a potential captured volume of 620 gallons. Evaporation and a few other factors reduce that slightly; let’s say 10 percent, so for simplicity’s sake we’ll work with a nice rounded figure of roughly 600 gallons on a 1,000-square-foot area for every inch of rain. Yep, that’s 600 gallons per inch. You either need many rain barrels, a big storage tank, or a smaller collection area. Or you can learn to manage your resources and water goals. An inch of rain falling on a 10-by-10-foot patio cover or roof collects enough water to fill a 55-gallon rain barrel. But once the barrel is full, you can’t catch any more. So, after each rainstorm, when the soil is ready to absorb water without it running off the property or damaging your structures, choose appropriate spots on your property to empty the barrel. This simple management technique captures water that you can direct to a specific area of your garden. It also helps capture runoff from your property and avoids wasting a valuable resource by keeping it out of the municipal system. This strategy is good for the garden and our community. Plan how to convey captured water for effective use in the garden. Of course you can empty the tank into buckets and carry it, but one gallon of water weighs eight pounds. No need for a gym membership each winter. Gravity flow is the most cost efficient. Direct a hose, drain piping, or just dig a trench to convey water away from structures to an area in the landscape that can receive it without runoff. Toward the end of the rainy season, I stop releasing captured rainwater so I can collect a full load to supplement my summer irrigation needs. I release about half of a single barrel in July and the rest in August to my chosen spot. My first choice is usually to support trees. Where I have enough room, I add two rain barrels for each tree or selected area so I can do an additional release in September. This method works well for low-water-use trees. You need more water than a rain barrel can provide for trees that need a lot of water. I use a bigger tank that doesn’t take up much room. I had a Bushman USA 205-gallon tank that was less than three feet in diameter and about five feet tall, fed by a 600-square-foot roof area, to water one area of my garden assisted by a solar-driven pump. With six inches of rain, I could collect about 2,000 gallons, filling the tank nine times. By the end of the rainy season, the garden had a good supply of moisture in the soil so I didn’t need to water my plants from mediterranean regions again until late in the summer. I used zero potable water in this area of my garden. If I had native plants in that area, I would not even need the extra summer water. Los Angeles averages 15 inches of rain, but recently we are down to just 6 inches. Capturing and managing the rain we do get helps my garden get back up to 15 inches in the vegetated areas. And you can do more with bigger storage tanks and other ways to convey and release water. 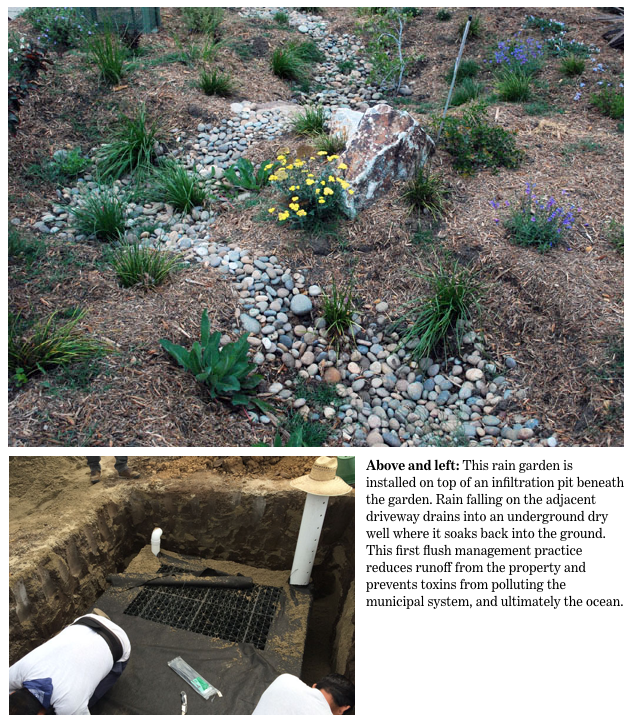 Recently, my colleagues and I at the Urban Water Group completed a pilot project in Los Angeles where we designed and installed six case studies at private residences to demonstrate rain capture and different release techniques to reduce potable water use in the garden, manage stormwater pollution, and reduce peak storm flows. The local water/utility agencies and the homeowners manage these systems together. In this case study, the capture area was a 908-square-foot roof. Gutters and downspouts directed rainwater to a 1,320-gallon tank located in the side yard. The tank, which is just less than seven feet in diameter and a little more than six feet tall, sits on a level gravel pad. Gutter Glove devices were installed to keep debris out of the collection system and help control mosquitoes; clean water going into the tank means fewer issues later on. 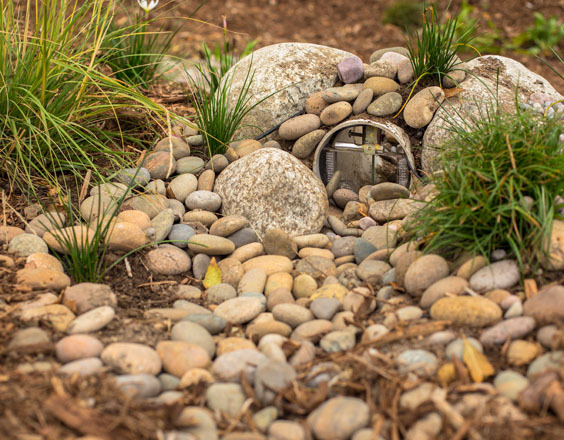 A pipe conveys collected water to the front yard where an automated valve—that can also be operated manually—opens the flow to the rain garden. 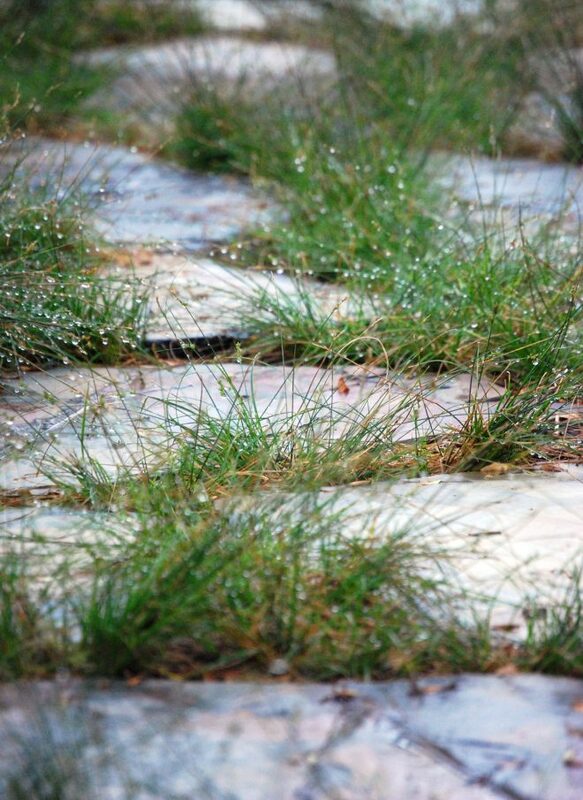 Water infiltrates the rain garden where it is banked in the soil and supports deep-rooted plants. A hose also attaches to the tank so citrus trees in the side yard can be watered. Finding available space for siting tanks is always a consideration. Homeowners with limited space can connect multiple smaller tanks with an external manual tank gage to show the combined volume held within the tanks. We connected four 2000-liter tanks (528 gallons) for a potential total collected volume of just over 2,000 gallons. The 22-inch-wide by 94-inch-long tanks were installed on a concrete base with four upright steel posts supporting each tank. 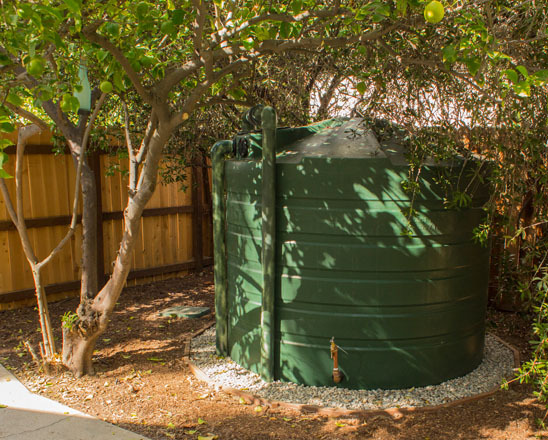 Slimline tanks hold 730 gallons on an efficient footprint; these also require an appropriate foundation for earthquake safety. Another case study featured a 1,036-square-foot collection area that feeds two connected 865-gallon tanks for a total holding capacity of 1,730 gallons. An external pump delivers water to a drip irrigation system, which waters the entire backyard landscape of low-water-use plants all summer. When the collected water supply is depleted, an automated and metered system supplements the tanks with potable water until the next rainstorm. Irrigation is managed with a smart control device. Adding a pump to pressurize water coming out of the tank increases the flexibility of your system if gravity isn’t working in your favor. 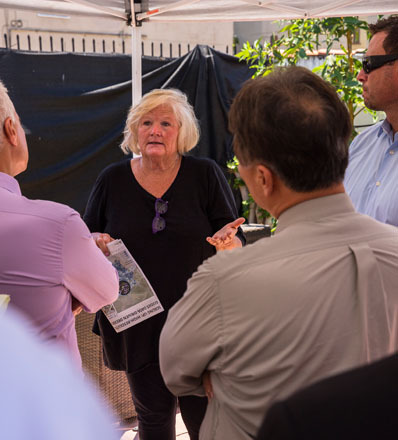 In addition to connecting to your irrigation system you can use a hose with the system and, where local code allows, even use harvested rainwater for indoor purposes; residents in Los Angeles can now use non-potable water in toilets and for laundry. Not everyone wants water storage tanks on view, or maybe you don’t have room to hold the volume you want to store aboveground. In that case, installing underground tanks, or cisterns, can provide storage without displacing usable garden space. Depending on excavation and installation costs, this approach may be more expensive. There are many choices of tanks that can be buried; some are engineered so they can be located below drivable surfaces, others are not. Tanks are available in many sizes to meet your storage goals and, like aboveground tanks, underground tanks can also be linked together. Check your local code for guidelines on where you can place underground tanks to ensure that emergency access to your property is not affected. In the case study depicted above, two underground tanks were installed and connected, providing a total storage volume of 3,574 gallons. Each tank is 14 feet long, and the excavation was less than 6 feet deep. Harvested water is used to irrigate low-water-use plants in the backyard using drip irrigation. The catchment area feeding these tanks is just over 2,400 square feet. 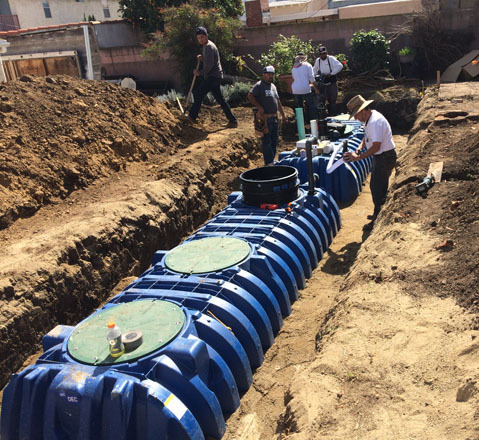 In normal rainfall years in Los Angeles, this system can harvest over 20,000 gallons. The overflow in this collection system is diverted to a rain garden in the front yard. Automated controls access local weather forecasts and release stored volume in anticipation of expected storms to optimize the catchment and infiltration potential. 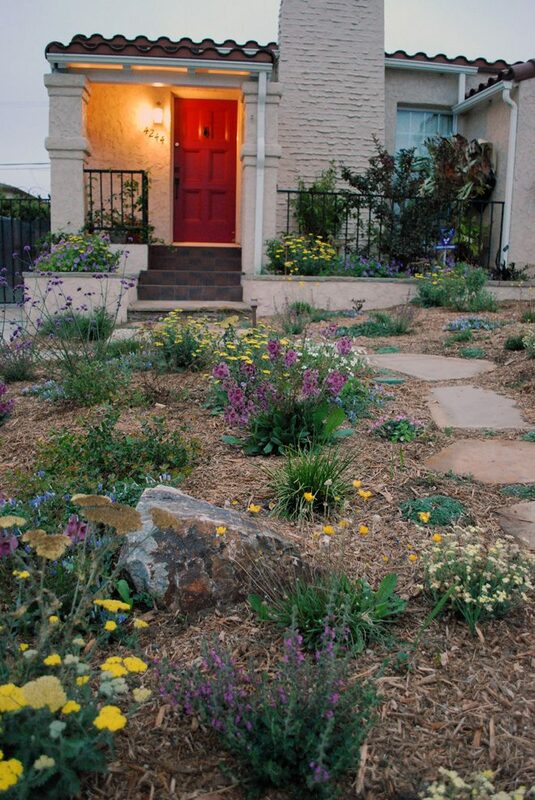 In addition to underground storage, water feeding from rain gutters and downspouts at the front of the house is directed out into the rain garden, which was sized to accommodate direct rainfall as well as overflow from underground storage tanks. Rain that falls on hardscaped areas on this property is conveyed to an underground dry well or infiltration pit via a drain cut into the driveway where it soaks back into the ground, reducing pollution headed to the ocean. For more on “first flush” best management practices see “The New Normal” by Tom Rau in the summer 2016 issue of Pacific Horticulture. You, too, can make a difference on your patch of earth by choosing permeable hardscape elements, collecting and managing rainfall for release or direct infiltration, and keeping runoff from impermeable surfaces. 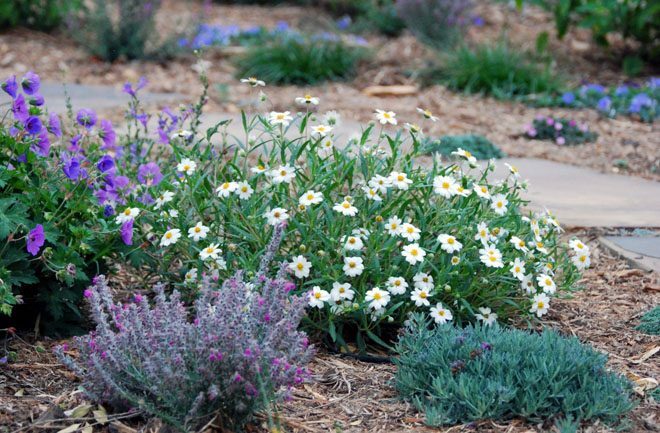 All are excellent choices to help your garden gather moisture from passing storms. You too, can be a part of the solution. And that makes me very happy.